Shasta Creations has a full-time in-house graphic artist and embroidery digitizer to develop the design for your screen printed or embroidered garment. Our rate for artwork preparation is $40.00 per hour with a 30 minute minimum charge. Embroidery tape digitizing fee starts at $40.00. You may also submit your own artwork. To be production-ready (also called camera-ready), it must comply with the �Artwork Submission Guidelines� below. Even if your artwork is not production-ready, it can still be valuable as a guide to help us visualize what you want while we redraw your artwork. 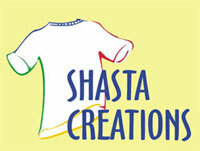 Shasta Creations will determine whether customer submitted artwork is production-ready. If it is not, there may be an artwork preparation fee to �finish� the artwork. For embroidery jobs, a .jeg file or paper copy of the artwork is generally sufficient. a high resolution (300-600 dpi) Photoshop (.psd) file in layers or channels. For vector files, convert text to outlines, curves, or paths. If not converted, send us the PC font file. Send ALL support files or images (scans, logos, etc.) used. Submit in PC format only. providing on disk (standard 3-1/2� floppy disk or CD).